I am a long time resident of Yellow Springs, Ohio, 56 years to be exact. I am a metal detectorist at heart and enjoy the hunt when metal detecting. “Treasure hunting” usually has a start in our childhood and it was true for me too. When I was a kid gypsys left treasures beside our road by the mailboxes. Fishing equipment, games, 1026 raleigh coupons, a tape recorder and many other items were among the trove. For a 12-year-old that was a great find! As an adult, I have found a 1972 silver dollar. I have been the proud owner of a Whites DFX for 10 years and more recently picked up another. The new detector is a Fisher 3Z3D and I have had it for 6 months now. 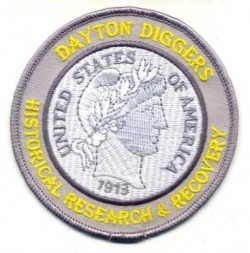 I have been a member of the Silver Seekers and first found the Dayton Diggers by searching on the web. Since joining I understand we may have to “qualify” our ability to dig and I have a few thoughts on that subject. When it comes to digging, I prefer to use a shovel but I can always rent something if digging a really big hole! I look forward to meeting more of the Dayton Diggers Soon!